Description: Roger Bergh's work is always an inspiration. The handle is formed from a single piece of stabilized oak that has been cross cut. The result is a central point from which rays radiate outward. The wood is carved at the front. 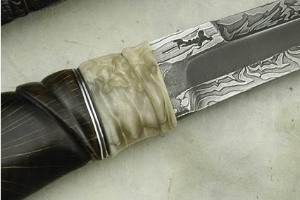 This is surrounded by a musk ox horn bolster and end cap. This horn, which is quite rare, has a tremendous texture caused by the mixture of transparent and opaque sections. The handle is extremely comfortable in the hand. 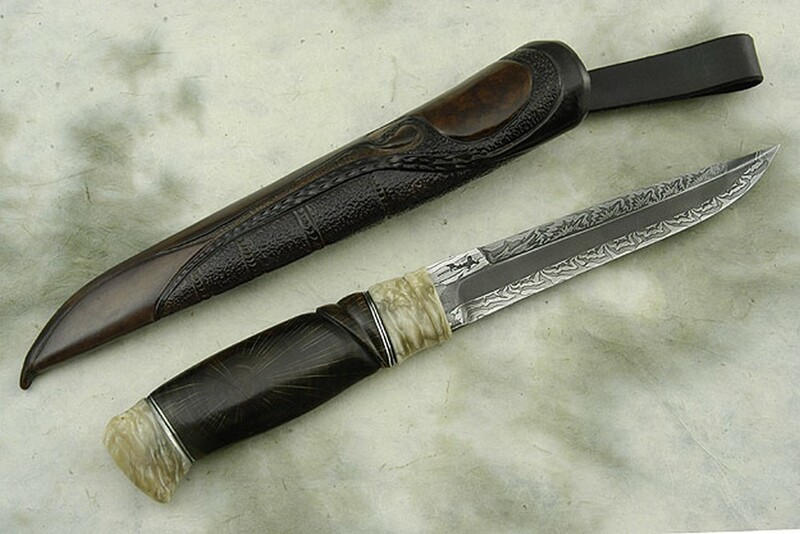 The blade is forged from a three bar composite. The center bar is solid high carbon steel. This has been surrounded by firecracker pattern Damascus, which forms and exceptional cutting edge. Excellent fit and finish throughout.